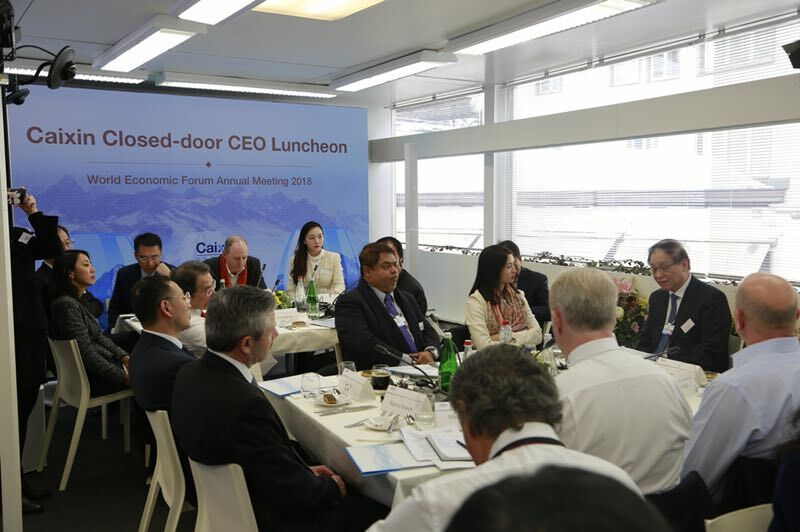 DAVOS, SWITZERLAND (January 25, 2018): As an independent and authoritative media committed to providing quality business and financial news about China, Caixin Global held Caixin Closed-door CEO Luncheon during the World Economic Forum 2018 in Davos, Switzerland, on the topic of China's economic reform and its impact on Chinese enterprises that aim at global development. The luncheon invited guests from Government of Singapore Investment Corp., Boston Consulting Group, Canada Pension Plan Investment Board, UBS Group AG, Deppon Logistics Co., Ltd, Baota Petrochemical Group, AMTD Group, etc., to have in-depth discussion on topics such as China's economic policy, financial market opening up, international competition and so on. Liu Mingkang, former chairman of the China Banking Regulatory Commission gave a 15-minute keynote speech, followed by 45-minute discussion aiming to involve most of the CEOs. Francis Leung, chairman of the Chamber of Hong Kong Listed Companies, Chow-Kiat Lim, chief executive officer of GIC Private Limited, and Mark Machin, president and chief executive officer of CPP Investment Board chaired each topic discussion. They respectively led top discussion of “Global competitiveness of Chinese firms”, “New challenges for global companies”, and “Company long-term value creation”. Participants were engage in intensive discussion, sharing their own understanding and expertise.